East Bengal put up a sparkling performance against a hapless Minerva Punjab FC to register a thumping 5-0 victory in the Hero I-League 2016-17 match played at the Guru Nanak Stadium, Ludhiana, Punjab. The ground conditions were very shabby as the turf lacked good amount of grass in most of the parts of the ground. Goals from East Bengal's attacking trio Robin Singh(65th), Wills Plaza(40th) and Wedson Anselme(9th, 64th, 66th) ensured that the Red and Golds move to top of the Hero I-League 2016-17 table. Wedson started the firework as early as the 8th minute when he found the net from a Lalrindika Ralte's cross. Willis Plaza added the second before the half time when from a Rahul Bheke's ball he finished off a move that was started by Robin Singh. In the second half, any chances of a Minerva fightback was put to bed in the space of three minutes. Two Wedson goals sandwiched between a goal from Robin Singh dashed all Minerva Punjab's hope in their first home match. 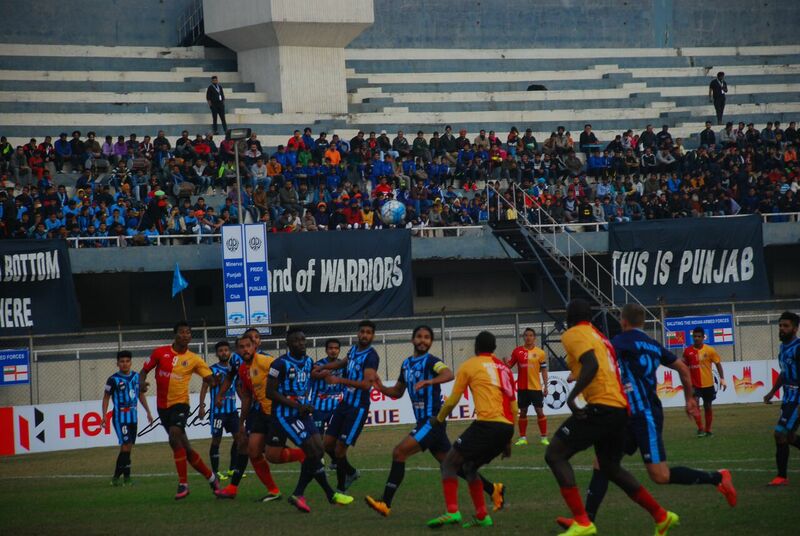 With the victory, East Bengal moved to top of the table with 13 points from 5 matches while Minerva Punjab FC still lying rock bottom with just a single point from their quota of 5 matches.